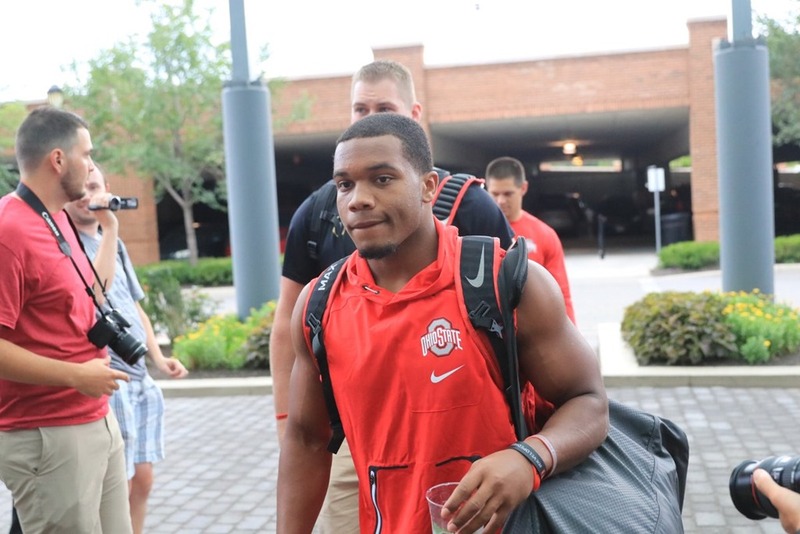 True freshman JK Dobbins has sprinted ahead of the depth chart for the Buckeyes at running back this fall and might get to play quite a bit against Indiana (August 31st) in the opener with Mike Weber sidelined with a hamstring issue or with him in the game. With Mike Weber and Demario McCall already set to provide depth at running back in the Spring, Dobbins entered the team early from high school and began to show what he is capable of. Now in the fall, he is showing not only great talent but the ability to block well and the understand the plays that Ohio State wants to run this year. Dobbins passed Antonio Williams in the spring and has moved into the second spot in the rotation after McCall switched to an H-Back roll in the fall. Parris Campbell has the top spot at H-back at this time. But McCall will also be returning punts along with KJ Hill. The one knock against Dobbins is that he sat out his senior season in high school with injury, therefore its been a couple of years since he has played. But his parents will be getting a call saying that their son will be playing the week of the opener. Weber finished his red-shirted freshman season last year with 1096 yards and 9 touchdowns, so he’s the clear first string back going into the season. Running backs coach Tony Alford has stated that Weber will play in the opener. In fact, he went full speed in practice on Monday. But having a backup to rest the starter is always a requirement. Weber is glad to be back on the field and was a little anxious watching Dobbins getting reps while his hamstring recovered. Dobbins speed is incredible according to defensive lineman on the team and he has the shake to make defenders miss. The excitement around him playing this fall is something not seen in a couple of years in Columbus. Head coach Urban Meyer also commented on his work in the weight room and in the classroom.